Hawaii lags much of the nation in spending on state-funded preschool. But it is taking new steps to expand access, including opening five new classrooms next year. When it came time to find a public preschool for his 4-year-old son this school year, James Peck was one of the luckier parents. 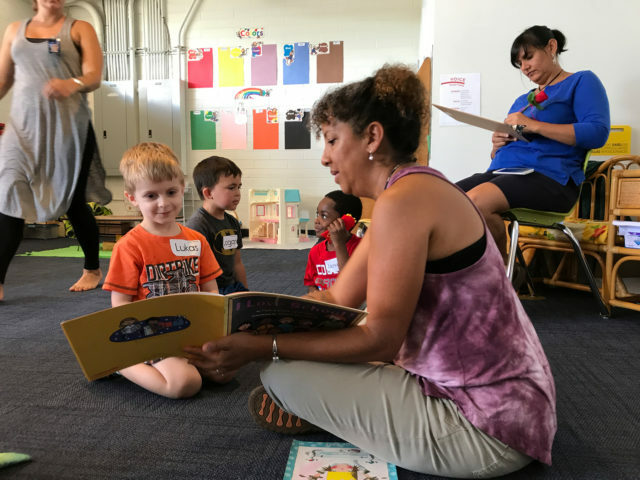 His son, Leo, is one of 15 kids enrolled in the inaugural preschool program at Kamalani Academy, a new Hawaiian-focused arts integration charter school in Wahiawa that serves pre-kindergarten through grade 8. Teacher Lisa Jeffers-Fabro reading to preschoolers at Kamalani Academy, a public charter school. Finding affordable preschool for children remains a challenge for families in Hawaii. A private preschool in Hawaii can cost hundreds of dollars a month or even exceed $1,000 for families, depending on the program and age level it serves. 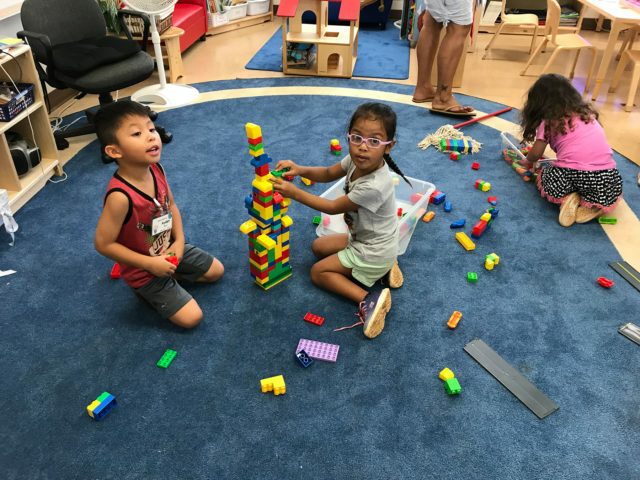 The $11,232 average annual price tag of center-based child care for a 4-year-old in Hawaii is highest in the nation as a percentage of median income for married couples, according to Child Care Aware of America. And Hawaii ranks at the bottom of states when it comes to access to public preschool, according to a 2016 report by the National Institute for Early Education Research. Only 2 percent of all 4-year-old children in the state were enrolled in state-funded public pre-K in the 2015-16 school year, compared with the national average of 32 percent. While the Hawaii Department of Education no longer tracks statewide the percentage of students who attended preschool prior to enrolling in kindergarten, the most recent data from the 2013-14 school year show the rate is about 50 percent. There were 13,427 kindergarteners at the start of the 2017-18 school year, according to the latest state Department of Education enrollment numbers. 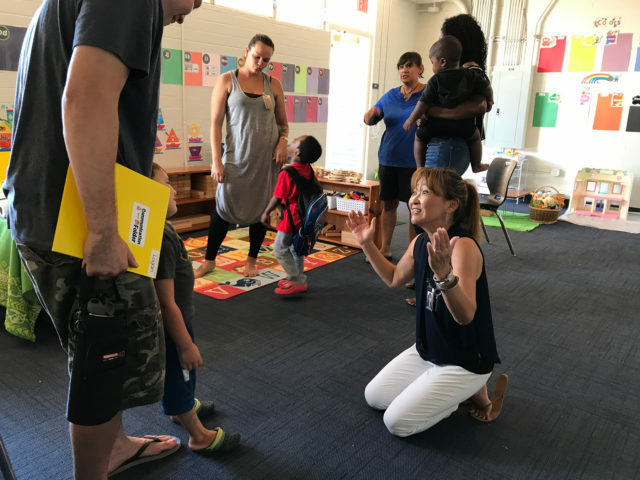 Compared with other states, “Hawaii has been moving really, really slow” when it comes to access to early childhood care and public preschool, said Deborah Zysman, executive director of Hawaii Children’s Action Network. This graphic from National Institute for Early Education Research shows levels of state-funded preschool enrollment nationwide. This graphic from National Institute for Early Education Research shows levels of state-funded preschool enrollment in Hawaii. But there have been incremental changes over the last year, including increased funding from the Legislature that will add five new pre-K classrooms in the 2018-19 school year and more authority to an early education advisory board. “I think it’s going to add some sense of strength and permanency to the idea of ‘yes, we are working towards … universal pre-K,’ because it’s a really small universe right now,” said Jonathan Gillentine, a retired early childhood and special education teacher in Hawaii, of the new governing board. 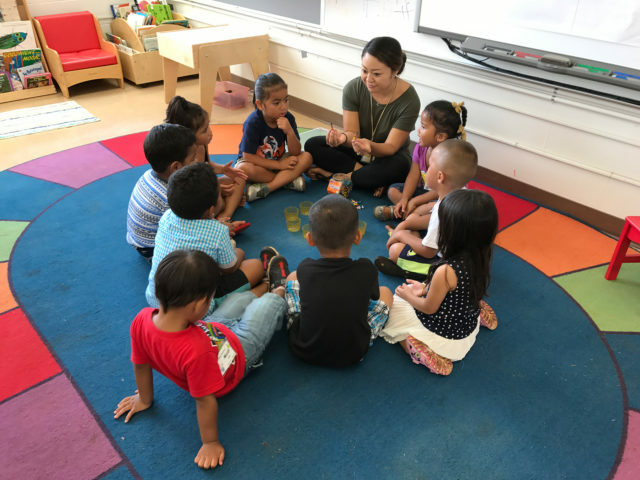 Kamalani, which as a public charter school is tuition-free, is one of 18 public charter pre-K classrooms across 13 schools in Hawaii funded through a four-year $14.7 million preschool development grant issued under the Obama administration. Statewide, the grant has the capacity to serve 360 4-year-olds. But enrollment is first-come, first-serve and limited to families whose income falls at or below 200 percent of the current federal poverty guidelines. With $3 million in legislative funding that was authorized in 2014, Hawaii’s Executive Office on Early Learning — an office established under former Gov. Neil Abercrombie — launched 20 preschool classrooms in 18 public schools statewide. Nine alone are located on Hawaii Island. Additional funding this past session will help bring five new pre-K classes next year into schools that were selected based on factors such as existing availability of preschools in the area, Title I status since there are income requirements for eligibility and buy-in from school administrators. “The most important factor was principal interest and commitment to the program,” said Lauren Moriguchi, executive director of EOEL. 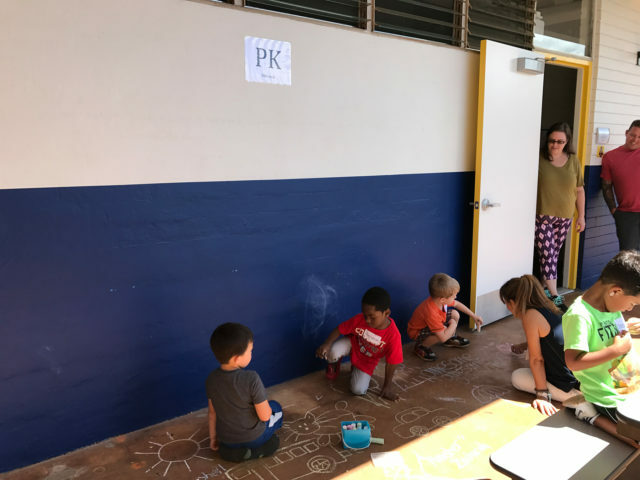 The five new preschool classrooms that will open in 2018 are at Kohala Elementary on Hawaii Island, Kula Elementary on Maui, Kilohana Elementary on Molokai, and Kailua Elementary and Kalihi Uka Elementary on Oahu. By 2018-19, the 23 public preschool classrooms will have the capacity to serve 520 kids. Priority is reserved for children in special education, English language learners and for families who earn at or less than 250 percent of the federal poverty guidelines. For a family of four that means earning no more than $70,725 per year for a child to be eligible. Early child education experts say that preschool is a crucial and fundamental step to preparing kids for kindergarten. They learn how to play and socialize with their peers, strengthen fine motor skills by using their hands and fingers and learn basic rules like how to share and wait their turn. There are other routes to free preschool in Hawaii, including federally funded programs like Head Start, and through state subsidy programs administered by the state Department of Human Services, such as Preschool Open Doors and Child Care Connection Hawaii, both of which have income requirements. In the 2015-16 school year, Head Start, which serves 3- and 4-year-olds, served 2,440 kids in Hawaii, according to the NIEER report. There are 120 Head Start classrooms statewide, plus 18 “Early Head Start” classrooms, which serves infants to children age two. Preschool Open Doors last year reached approximately 1,201 children, according to a 2016 DHS Annual Report. Funding for the program was also raised from $6 million to $10 million in 2016. One school that’s trying to address that is Linapuni Elementary, a school in Kalihi that serves only pre-K and first-graders from the nearby public housing projects. It has three preschool classes, including one operated through Head Start. More than half the student body consists of English language learners, with many students from Micronesia or the Marshall Islands who speak only Chuukese or Marshallese. This graphic from the National Institute for Early Education Research shows the percentage of kids enrolled in state- and federally-funded preschool in Hawaii. The preschool classrooms are separated into play areas that contain wooden blocks, Legos or Play-Doh and stations set up for finger-painting or using the water table. On a recent morning at Linapuni, Head Start teacher Cherie Yamashiroya was seated in a circle among her preschoolers, leading them in a song. “We do a lot with the families. I had to learn that my way isn’t the only way to teach,” Yamashiroya said of her inclusion class, referring to working with families from various cultural backgrounds. Her teacher’s aide, Yukie Esah, speaks Chuukese, so she’s able to communicate with students from Micronesia that don’t speak English. A couple classrooms away, veteran pre-K teacher Colleen Uejo sat with a student who was concentrating on molding Play-Doh into various shapes. Uejo, whose class includes special education inclusion students, says one of the most important aspects of teaching 4-year-olds is talking to them. Preschoolers build with Legos at their Linapuni Elementary School pre-K classroom in Kalihi. Research shows that 92 percent of a child’s brain development occurs by age 5, the age typically when a child enters kindergarten. A high-quality pre-K program, experts say, is crucial to developing skills such as learning rules, socializing with peers and being in a structured environment. Parents who have gone through the experience agree. Akeyo Garcia, a pre-K teacher at Kamalani Academy who previously taught kindergarteners at Ewa Elementary School, says she noticed immediately which of her students had attended preschool and which had not. “As a former kindergarten teacher, what we struggled with most is that children don’t have self-regulations when they come in: they don’t know how to share, they don’t know how to listen, they don’t know how to take turns — basically, all the skills they need to start learning,” she said. Kamalani Academy pre-K teacher Akeyo Garcia greets a preschool student on the first day of school. “Many of us are fighting with the state or city or anyone that listens for funds for publicly funded pre-K in the state,” she said. Hawaii’s constitution bars the use of state funds to support private educational institutions. A ballot initiative in the November 2014 election to amend the state constitution to allow for a public-private preschool delivery system was defeated by voters. The state’s inability to use public funds for private provider contracts — like the model adopted in New York City – puts the state in a bit of a vise, said Zysman, of Children’s Action Network. But the issue goes beyond just funding to more deep-seated challenges. The Executive Office on Early Learning has received in-kind support from the Omidyar Group and Collaborative Leaders Network, another Omidyar organization. Pierre Omidyar is the CEO and publisher of Civil Beat.